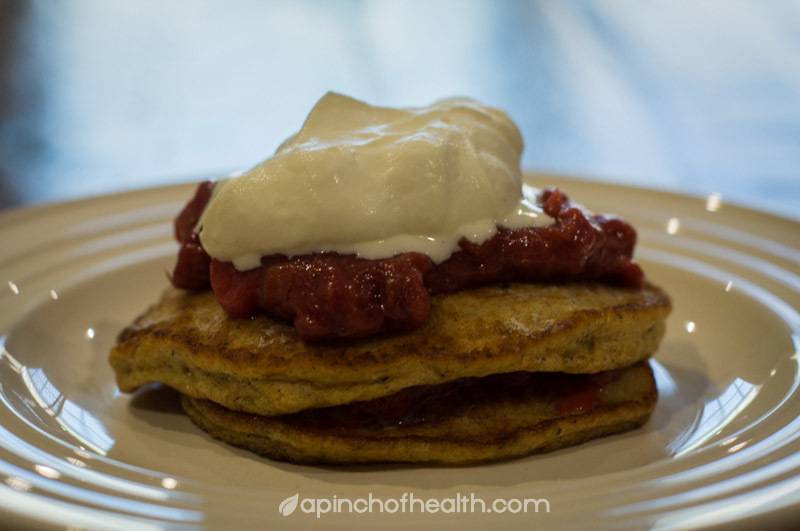 If you are constipated try these low carb pancakes for breakfast . Mix all together in bowl and stand for a few minutes. Then cook as pancake or a few small ones . The post was edited 3 times, last by Sherrie: formatting, photo, carb count ( Jan 22nd 2015, 10:50pm ). Had these again for breakfast but this time I changed the recipe. 2 eggs , 1 desert spoon Psyllium husks , 1 desert spoon linseed meal . 1/2 tsp baking powder . 3 desert spoons cream . This time no splender . They were not to bad . psyllium pancakes (+ protein powder) cooked in the $15 tiffany omlette maker. Served with cottee's diet jam and cream. YUM and sooooooo filling. home made jam and ricotta cheese on top - very yummy!! I made these today but forgot the baking powder, very yummy but I found them fragile. I had mine with a little apricot jam and they were yum, Maya had some on their own and liked it. Tomorrow I will try again but this time I will use cream cheese instead of cream as I just discovered that 2 tubs of cream were off! I never thought of using an omelette maker for pancakes - what a great idea and I just so happened to have bought one today Pancake omelettes for breakfast it is. Okay I made these again this morning but this time I subbed the cream for cream cheese and I remembered the baking powder though didn't use as much. They were definitely more firm with the cream cheese but they were very thick even with some water added. Next time I may try it with the cream cheese again and some water but without the baking powder. I made a double batch of the original recipe today, each batch gives 3 pikelet size pancakes so I made 6. I'm not sure why I posted in here that they were fragile, I found these to be the least fragile low carb pancake ever! After i cooked them up I put 3 in the oven in a stack with some lindt until melted, I had half a square in between each pancake then one square on top. I then served them with a scoop of espresso gelato. Next time I will only use 2 pancakes as three were way too filling, must be the fibre! I made another double batch today and used less then 1/2 tsp of baking powder and they still turned out good. Sherrie, your photos are so nice! You are very talented, both the cooking and the photography. How kind of you to calculate the carbs, too. I feel much more full after 2 pancakes and a couple of big glasses of water than I ever did after eating a whole family-sized pizza by myself. Or a whole BBQ chicken from Coles or Woolworths. I like them with sugar-free maple syrup and butter, or sugar-free jam (I have strawberry and apricot in the fridge) and whipped cream. The last couple of times I've made these I used a recipe I got off the internet - 2 tablespoons of psyllium husks, 2 eggs, mix them together, and into the frypan with some butter. They come out fine, the only problem is that they can be a bit tricky to get into the frypan in the first place in a shape approximating a pancake as the mixture is so thick and gooey. The husks need liquid I wouldn't ruin a good recipe by removing the liquid. You could always use water if you don't want the dairy although I think the cream would help the taste also, but nut milk or coconut cream/milk would also work well I think. Funny thing is that it works fine with just the eggs and the husks, which I wouldn't have expected. I'll report back on how good they are with some cream as well.